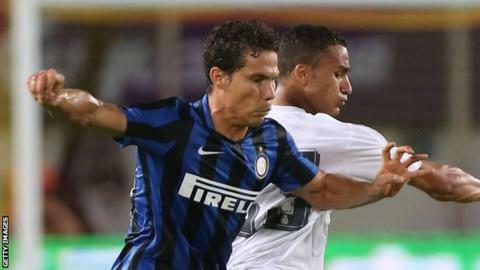 Italian champions Juventus have signed Brazil midfielder Hernanes from Serie A rivals Inter Milan for £8m with £1.5m add-ons. The 30-year-old signed a three-year contract shortly before the transfer deadline in Italy on Monday. Juventus have also completed the signing of Marseille midfielder Mario Lemina, 21, on loan for the season. Massimiliano Allegri's side have made a poor start to the season losing their opening two games. Juventus have lost midfielders Arturo Vidal and Andrea Pirlo to Bayern Munich and New York City this summer.